Have your galvanized gutters on your house developed holes? If yes, that means you need to repair them as soon as possible. Gutters that have developed holes cannot drain water effectively which can cause more damage to your house. Water drops from these holes can sip into your home causing damage to household items as well as the flooring. The good news is that patching up holes in galvanized gutters is a simple job that can take less than an hour. So how do you go about repairing galvanized gutters? – Pop rivet gun, pop rivets, silicon and a piece of metal flashing. Lean the ladder against the walls of your house in a safe angle to ensure your weight is balanced well. You need to clean the gutters especially around the areas with holes. Get rid of twigs and old leaves by hand. Ensure that you wear the leather gloves to avoid twigs and sharp objects from piercing your hands. Next, use the wire brush or the steel wool to thoroughly clean around the holes to get rid of corrosion. Wipe the areas around the holes clean using a piece of cloth. Take a small piece of wire window screen and ensure it is larger than the hole you need to patch. Before placing the window screen, spread the hole with roofing cement all around. Ensure that you tightly press down the window screen and don’t leave any air space. Spread another layer of roofing cement on the window screen. Check to make sure that there are no holes in the window screen. Take a piece of the metal flashing and smear the back of it using the roofing cement. Just like the window screen, press the metal flashing on the hole tightly. Wipe any excess roofing cement around the edges. Get a piece of metal one inch larger than the hole. Place the patch on the hole and using a drill, make two small holes through the patch and the gutter from inside. Apply caulk around the edges of the hole and the patch metal. Set the metal patch on the hole and use pop rivets to secure it in place. Apply more caulk around the patch and smoothen the patch using a finger. – Clean out gutters: You need to make a routine check on your gutters at least once or twice a year. Clean out old leaves and other debris that collect in your gutter. Use a hosepipe to run water through the gutters and check to make sure it flows through the downspouts. If not, use a plumbing snake to unclog the downspout. – Install splash guards: Sometimes water can travel too fast through the gutters and often times it can end up splashing over to the ground. To avoid this, have a professional install splash guards on your gutters. – Install gutter guards: When you allow debris to sit for long in the gutters, they end up causing corrosion which leads to holes. To avoid debris collection in your gutter, call a professional specializing in gutters in Toronto to install gutter guards. These guards are usually mesh type screens that are fit across a gutter to prevent debris from getting into the gutter. After installing the gutter guard, ensure that the openings don’t get clogged. What Can Affect Your Gutter Installation Cost? It can be really confusing to determine the cost of gutter installation or replacement. This is because you have to shop around for quotes from several companies. If you do not know what exactly constitutes the cost, you may easily make the wrong choice and end up with the wrong results. It is important to ensure that you get quality gutters for installation or replacement. Price is one of the factors that tells you a lot about the quality of gutters. Here is a look at the elements that constitute gutter installation cost. Gutters are made of different materials. Some gutters are made of copper while others are made of steel. Most gutters are usually made of aluminum. Gutters made of copper are more expensive because they are more durable. Aluminum is a great option because it comes in a wide variety of colors without any additional cost. Moreover, it is available in a wide variety of thickness, which affects costs. In that case, you will spend more when you use copper gutters. Aluminums gutters will have varying costs, depending on thickness. When shopping for a Toronto eavestrough, you will have to choose from different gutter widths. More often than not, you will be offered gutters with a width of 5 or 6 inches depending on the service provider. That means spending more on wider gutters and less on gutters that are not wider. This is because gutters with great width require more material for manufacturing. There are fastening gears for installing gutters. Once again, cost of gutter installation will vary depending on the gutter company and the type of fastening gears offered. Different companies offer varying gears. The most basic gears offered by gutter companies entail hangers and spikes. Although it is the cheapest fastening gear, it is least durable and weak. This means that it will only be a matter of time before your gutters disintegrates. Quality hangers are effective for gutter fastening. They are usually more expensive but guarantee you durability and protection. It is the best solution for minimizing gutter maintenance. With quality hanger system, you do not have to worry about water filtration as a result of clogging. 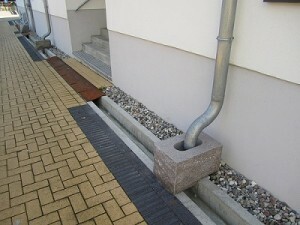 The type of downspout will affect the overall cost of gutter installation. In addition, the number of downspouts that you choose to have in the gutters will reflect in the overall cost. Certain options such as rain chains also add to the cost. When working on downspouts, it is important to work with the right numbers. Undersized downspouts usually lead to issues such as water infiltration and overflows. Getting your own gutter accessories is a matter of preference. In certain cases, you may also get the same from what a gutter Installation company offers. Gutter installation cost will increase depending on the number of accessories that you have in the eavestrough system. For instance, if you choose to have downspout extensions, leaf guard and rain barrels, you will actually end up with a higher cost. Something else that can influence the overall cost of gutter installation is detail. It all depends on how much attention goes to details. If you are meticulous, it may reflect on your gutters but you will have to pay a higher price. A good example is how things are done for prefabricated corners. More often than not, prefabricated corners do not require much for installation. However, they are not appealing aesthetically. To make these corners more appealing, you may have to pay a little more. Gutter installation services differ from company to company and this is reflected in cost. The overall cost will be determined by the choices you make around these factors.